The Cincy Eastern Bypass is about our region’s future. Now is the time to build it. Scroll Down. The Citizens for the Cincy Eastern Bypass is a diverse group of Political and Business Leaders, and other Citizens across the Greater Cincinnati Region. We support the immediate planning and construction of the Cincy Eastern Bypass because of its very high regional transportation and economic value. As part of the Brent Spence corridor solution, we believe that it is a vital project for my community that must be built now. 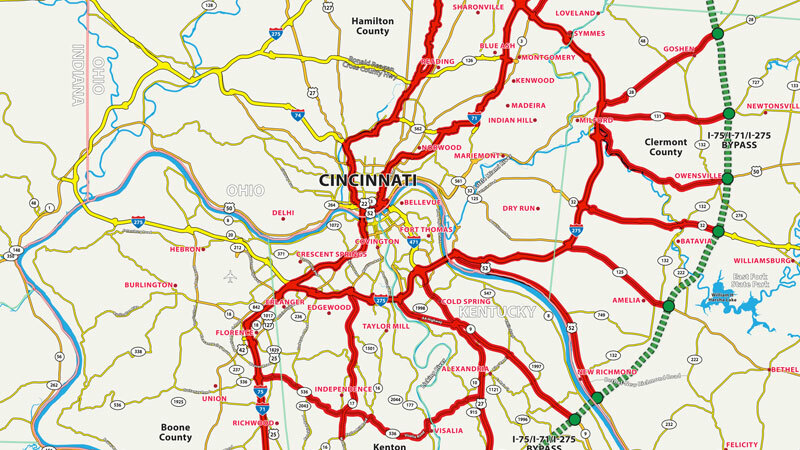 Our clogged transportation arteries need the Cincy Eastern Bypass. 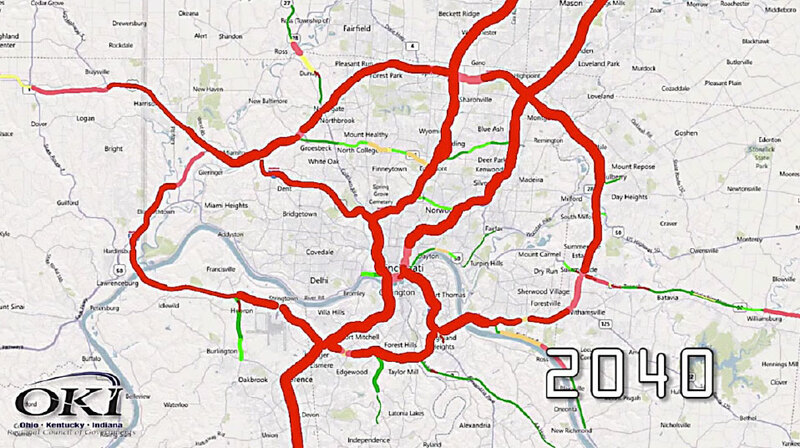 THE PROBLEM IS our largest transportation arteries I-71, I-75, I-275, and I-471 are congested and getting worse. The adjacent map shows OKI’s projections for 2040 gridlock if significant new highway thru-traffic capacity is not added. THE OKI 2040 REGIONAL TRANSPORTATION PLAN does not address the problem. The Greater Cincinnati Region’s long term plans only address easing small bottlenecks and replacing aging infrastructure throughout the region. While alleviating bottlenecks like supplementing the Brent Spence Bridge and replacing the Western Hills Viaduct are important, none of this will add even one lane of capacity to any of our major thoroughfares. OKI recognizes the extreme expense involved in adding just one lane of capacity to our existing roadways, thus the need for the Cincy Eastern Bypass. 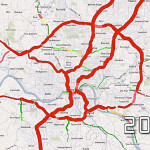 OUR CLOGGED TRANSPORTATION ARTERIES NEED A BYPASS – THE CINCY EASTERN BYPASS. For those traveling through our region on I-75, the Bypass will add only 6 miles to their trip and saves time.One-fourth of the traffic that crosses the Brent Spence Bridge is regional thru-traffic, which does not stop in our region. Most of the semi trucks crossing the bridge are regional through traffic. OKI predicts that truck traffic will increase three times as fast as car traffic in the next 15 years. Diverting one-fourth of the traffic and most of the trucks around the region is equivalent to adding one lane of capacity on the I-71/75 Corridor for use by local travelers. THE EASTERN BYPASS’ ADDITIONAL BENEFITS are more than enough reason on their own to build the Bypass fast. Besides the tremendous benefit to the I-71/75 Corridor, the Cincy Eastern Bypass will substantially improve traffic flow capacity and driving safety on over 200 miles of roadway including I-71, I-75, I-275, and I-471. The Greater Cincinnati Region’s economic benefits are enormous. The Bypass has been estimated to generate 208,000 jobs and $27B of economic development within just 2 miles of the route. The Bypass is vital to the future success of our Greater Cincinnati Region. KENTUCKY AND OHIO NEED TO WORK TOGETHER TO MAKE THE CINCY EASTERN BYPASS A REALITY In the Fall of 2017, the Kentucky Transportation Cabinet released the results of a year-long study on Brent Spence Bridge alternatives, including the Cincy Eastern Bypass. The Citizens for the Cincy Eastern Bypass appreciates the effort involved in putting these studies together. Thank you to the leadership of Governor Bevin for putting these resources in place. Through the study, the Bypass has been recognized as a valid project for its transportation and economic benefits. In 2018-19, KYTC will continue to study the Cincy Eastern Bypass in more detail. For the Kentucky portion of the Bypass, the study will include a final route design and a financial plan, as well as an updated cost, economic benefit, and environmental analysis. Additionally, KYTC should collaborate with ODOT to re-establish a “right sized” Brent Spence Bridge plan and cost estimate, along with a financial plan. In 2019, we are asking for ODOT to complete a similar study for its portion of the Cincy Eastern Bypass. With the help of Governor DeWine, the Ohio State Legislature, and regional leaders, we can continue to move both projects toward funding and construction. Why Build the CEB fast, can’t it wait? There are two major reasons to build it fast. First, if the Bypass is not built soon, right of way will be blocked because of new development. The merging of Dayton and Cincinnati is happening in Warren County. For every year that we wait, there will be more obstacles in the way and the costs will grow. There have been several instances in our history where development has stopped major transportation projects, like the Butler County Veterans Highway Extension to I-71 and the Cross County Highway to the East. Second, if the CEB is built now, its construction will delay, reduce the cost of, or eliminate other expensive planned highway projects. What will the bypass cost? Well, given the transportation benefits, 208,000+ Jobs, and $27B Economic Development, what is it worth?The cost estimates have ranged from $1.1B, by estimating costs based on similar projects like TN-840 and the Butler County Veteran’s Highway, to $3.2B, from KYTC in the 2018 Brent Spence Bridge Corridor Study. While even $3.2B is a relative bargain, why were OH-129 and TN-840 able to be built for one third of that cost? The bypass seems so much longer, why would someone use it? The shortest distance between two points is a straight line, however I-75 is not a straight line. It has many twists and bends, steep hills, an intense amount of interchanges, and often congestion. The Bypass is only 6 miles longer for those traveling I-75 through our region. It will divert regional thru traffic, especially 18-wheeler trucks. The Cincy Eastern Bypass is to be built to 70 MPH interstate highway standards. The route is generally through open, mostly rural, areas. The steepest bypass grades are 3.5%. The dangerous I-75 “Cut in the Hill” grade is 5%. The routing was chosen to minimize the Bypass’ added mileage compared to existing I-75 and I-71 routing through our region and to minimize costs. Engineered CAD drawings for preliminary grading and alignment are complete and verify that these design objectives can be met. Why do we need a bypass, we already have I-275? If an I-75 through-the-region traveler were to use I-275 East as a bypass, they would be adding 17 miles to their trip (I-275 West adds 20 miles) and would often encounter gridlock. By comparison, this same traveler using the Eastern Bypass would add only 6 miles, reduce travel time, and encounter great driving conditions. Can the Cincy Eastern Bypass eliminate the need for a Brent Spence Bridge improvement? The simple answer is no. While the Bypass will reduce corridor traffic and make it feel safer with many less trucks, the Brent Spence Bridge will still have congestion and will still be classified as functionally obsolete. The Bypass will, however, compliment the bridge project because it will allow for a replacement bridge that is “right-sized” to traffic projections after accounting for the vehicles that are diverted to the Bypass. TheBypass will also provide a great benefit during construction on the Brent Spence Bridge. If Nashville can build a bypass, why can’t we? Tennessee completed the 78-mile TN-840 Expressway in 2012 at a total cost of $755M ($9.7M/mile). It plays a vital role in Nashville’s regional connectivity and economic growth. 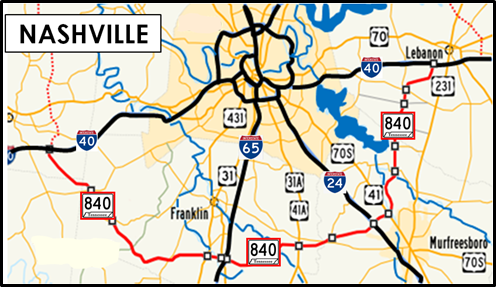 In 2016, the Route was accepted as an interstate, I-840. 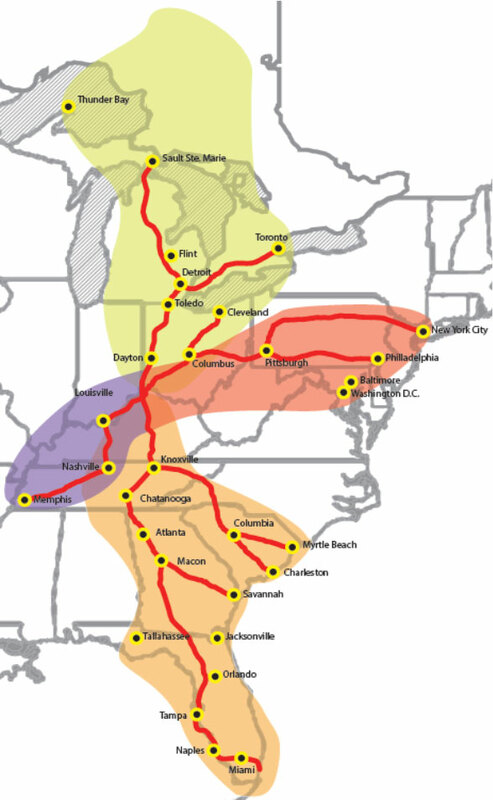 It is so successful that discussions are underway to complete the loop to the north of Nashville. Nashville is the fastest growing city within an 8 hour drive of Cincinnati and the 7th in the country. An investment in the Cincy Eastern Bypass is critical for our region to remain economically competitive with other Midwestern and Southeastern cities. The Kentucky Transportation Cabinet (KYTC), under the direction of Governor Matt Bevin, commissioned the Brent Spence Strategic Corridor Study to analyze multiple options to relieve congestion and improve cross-river mobility in the Greater Cincinnati and Northern Kentucky region. The Northern Kentucky Outer Loop Study examines potential alternatives for the Cincy Eastern Bypass in the southern portions of Boone, Kenton and Campbell counties, as well as the northern portions of Gallatin, Owen, Grant, Pendleton and Bracken counties. Sign up below and let us know how you’d like to help. Sign our petition below to add your name to the growing list of individuals who are supporting the cause for an alternative solution to the current proposed plan for the Brent Spence Bridge. Want to keep up to date with news regarding the bypass? Simply sign up for updates using the form below.